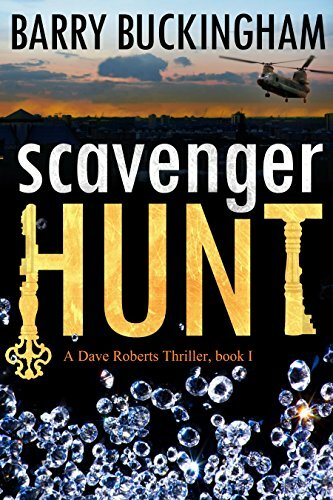 Before you buy this book or read it for free, have a look at The Hunt Trilogy – you get Scavenger Hunt, Man Hunt, and Hunted, with a bonus book, Barracuda Jewel in one easy downloadable pack. 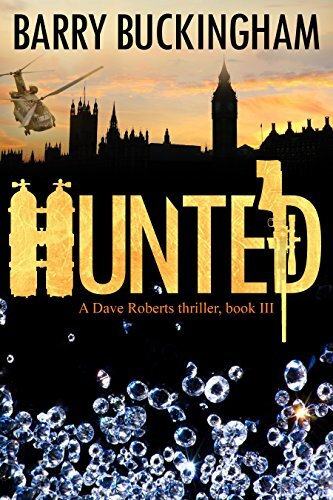 Man Hunt, the second in The Hunt Trilogy series is available to purchase or read for free from Amazon. Follow the link at the end of this sample to be redirected to the editors Amazon page. Dave sat up and twisted around on his bunk. Swinging his legs over the edge, he looked around the room. “This place stinks!” he thought, blinking and shaking his head. As he stretched, he glanced over at the window opposite. He smiled as he thought about the night it was smashed. One of the lads had found a ball in the mess and taken it back to the bunkhouse, a game of five-a-side football had started up, resulting in the window getting broken. He grimaced about the trouble they had gotten into over it. “What a night though!” he smiled to himself. His eyes followed a sliver of light that had found its way through a split in the wood covering the window, showing the dust floating around the dorm. As it cut across the floor and over the top of his bunk, it lit up the picture he’d stuck to the wall above his pit, lighting up Poppy’s face. He kissed his finger and touched it. “I’ll be home soon, darling,” he smiled. He pulled his desert combats out of his holdall and slid them on, retrieved his boots from the floor, checking first to make sure nothing had crawled in overnight before pulling them on. One of the other lads a few months prior hadn’t checked, getting up late he’d rushed to get to the mess before duty, putting his foot in he’d disturbed a scorpion and had ended up in the med-centre before being casevacked back to the U.K. Standing, Dave stretched and touched the low ceiling with his fingertips and thought about the day ahead. Running his fingers through his hair, he yawned and roughly rubbed his face. He pulled out a T-shirt then plonked himself back down on the edge of the bed to tie his boots. It sounded like Poppy. He jumped up with a start – his heart was beating so fast it felt like it was going to jump out of his chest. His whole body was soaked in sweat and he was trembling. He sat scanning the room, there was no one there. The night light he’d started to leave on when he went to bed shone with a low, red glow making it look like a cheap whore house. Rubbing his face with his hands, he took a deep breath. It had been another nightmare, the second this week. He got up, changed into something dry and went down to get a cup of tea. “Try to calm myself down a bit before going back to bed,” he thought. He was really making excuses not to go back to sleep. He looked at the clock, which showed 00:35. He couldn’t believe it, he had only been in bed for thirty minutes. Down in the kitchen, as he was filling the kettle, a flash of light from the bottom of the garden caught his eye, but his head was starting to thump as a headache came on, so he put it down to his brain playing tricks on him. Once he had his tea and a couple of paracetamol, he looked out the window again, but couldn’t see anything. He turned to go back upstairs, but as he looked at them he knew going back up to bed could bring the nightmare back. He needed to sleep though, his head was thumping, and laying down would help it go away. As he climbed back into his pit, he thought about Poppy and drifted off. 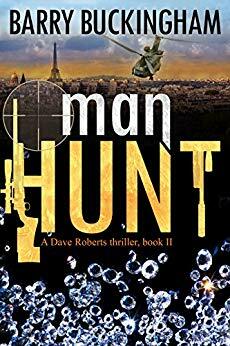 Man Hunt can be found on the author’s Amazon page here. Before you look at Scavenger Hunt click here to have a look at The Hunt Trilogy. 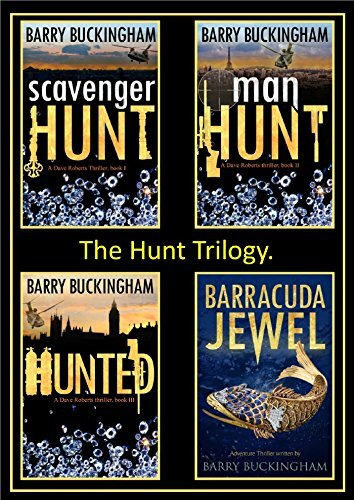 You get all three books plus a bonus book, Barracuda Jewel in one easy downloadable pack.